When did you last sit down and eat a meal? I don’t mean sit as opposed to eating on the hoof. Something I used to do quite often. I don’t mean slump on a chair with a plate of food and shovel it in while you watch a film. Update your Facebook status. Get involved in a Twitter debate. Browse the news. Read a good old-fashioned book. Or all of the above. I mean clear a space among the books and papers on the table. Pull up a chair. Eat. Nothing else. Just eat. Feel the way a cherry tomato bursts on your tongue. Savour the texture of Wensleydale cheese. With cranberries. Wonder why you never noticed before that cucumber doesn’t taste the way it did when you were a child. I haven’t got time for all that. That’s my gut reaction. Probably most people’s. My mind goes into freefall. What a waste. Just eat? I could do something useful. Update my Facebook status … OK. Read a book. That’s useful isn’t it? Just eat. Yeah. But it’s boring. I need to be doing something. Just eat. All well and good for those who’ve nothing better to do. I wriggle like a fish on a hook. I just don’t want to pay attention to something so mundane. Odd if you think about it. It’s fairly crucial after all. Breathing is too. We rarely give a second thought to that either. A good few years ago I was part of a Buddhist meditation group. The teacher told us it wasn’t possible to do more than one thing at a time. I may have laughed out loud. I was heavily pregnant. I had two children under school age. What I hadn’t learned about multi-tasking by then will never be worth knowing. He insisted. With the gentle persistence of one who is actually right. We can never truly focus on two things at once. We can learn to flit from one to the other so quickly we don’t notice. We’re never fully present to both at the same time. Some days I think I’m never fully present to anything. I fill with foreboding as soon as my eyes open. Leap out of bed and set the plates in motion. Spinning on their axes. Wobbling. Can I stop them falling? I drink tea while I’m dressing. Eat breakfast while I check my email. At least I eat it these days. 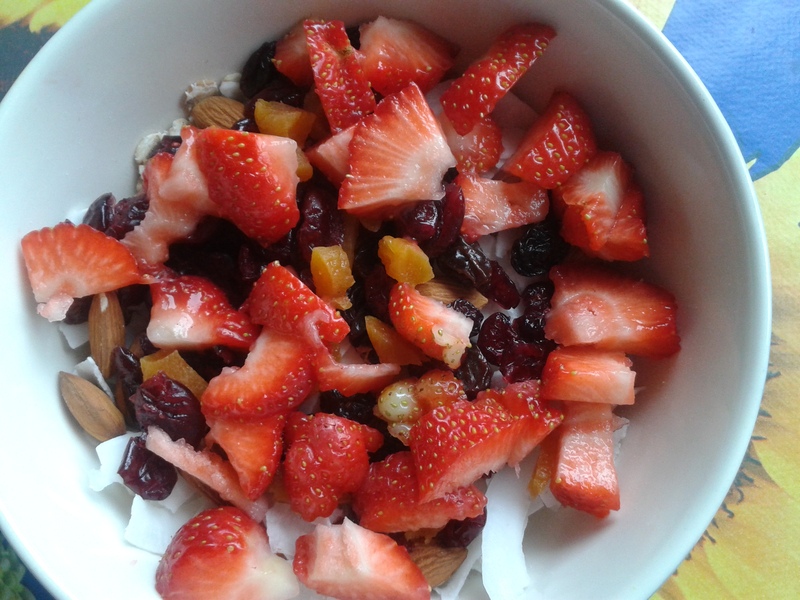 Muesli with fresh fruit. Don’t even notice it’s gone. That’s not good news when you consider that the mind and not the stomach tells us when we’re full. No wonder all those diets never worked. And if I stop? Hold the silence, when the smash of crockery is over … Find my breathing. Feel my breakfast on my tongue. Allow my eyes to soar with the gull against the sky outside my window. Upend all my priorities. Discover more is almost always less. Rich does not mean virtuous. Busy doesn’t always equal good. And it isn’t wasting time if I just eat.